On 4th July 2013 Connor Sparrowhawk drowned in a bath in an assessment and treatment unit in Oxfordshire. Connor was a handsome, creative, irreverent young man, who happened to have autism, learning disabilities and epilepsy. An independent investigation into his death found that it was preventable, that the risks presented by his epilepsy had not been properly addressed. A few months later, the Care Quality Commission found that the unit did not meet essential standards of quality and safety, describing it as ‘an impoverished environment with little therapeutic intervention or meaningful activities to do’ and noting several respects in which the building, equipment and the administration of medicines were unsafe. Connor regularly featured in his mother’s blog as ‘Laughing boy’ (LB), and became known to many within the disability and wider community through her tales of his jokes, creative endeavours and adventures. We learned about his love of transport, drum and base music, trips to London and his wide circle of family and friends. Connor’s death stunned those who had followed his mother’s blog, and its reverberations are being felt throughout the UK and around the world. A creative and organic campaign for justice – #JusticeforLB and 107 Days of Action – sprang up on social media, with a diverse range of people ‘adopting’ a day to coincide with Connor’s detention in the unit in 2013. Each adopted day involved an activity to raise awareness of what happened to Connor and the injustice faced by other people with learning disabilities in the UK and around the world. Connor’s own artwork features prominently in the campaign, adorning postcards, pencil cases, badges, and even our own conference flier. Buses also feature regularly, with a local bus company dedicating three buses to Connor. Here at Cardiff Law School, we held a very unusual and creative seminar, befitting an irreverent and creative young man, to join in the 107 Days campaign. We are very fortunate at Cardiff to have Professor Janet Read as an Honorary Professor of Law. Janet’s research specializes in the rights of disabled children and adults, and she also happens to be a super stitcher, and one of a creative trio who are putting together a Justice Quilt as part of the 107 Days campaign. Together with Professor Luke Clements, Dr Lucy Series and Erich Hou, we held a seminar ex plaining what had happened to Connor, describing some of the wider justice issues affecting people with learning disabilities and talking about a long and proud tradition of stitching and resistance. We were delighted that a delegation from Cardiff School of Art and Design came along, and around thirty or so of us spent a few hours stitching and gluing, knitting and drawing on squares for the Justice Quilt, whilst thoughtfully discussing what had happened to Connor and what needed to change. Connor’s death did not happen in a vacuum and was not an isolated event. A recent study found that 42% of deaths of people with learning disabilities were ‘premature’ (the CIPOLD study, 2013), a phenomenon which Mencap has called Death by Indifference. A major report by the House of Lords Select Committee on the Mental Capacity Act 2005 heard evidence from a wide range of sources of families of people with learning disabilities being pushed aside by professionals, as Connor’s family were found to have been. Several studies have raised concerns about unlawful de facto detention of people with learning disabilities; for the last months of his stay in the unit Connor did not have any formal detention safeguards which could have scrutinised the basis of his stay there. The kinds of assessment and treatment unit where Connor was detained have been plagued by successive scandals over the last decade – from the Cornwall scandal (2006), to Sutton and Merton (2007), through to Winterbourne View in 2011. Each scandal has triggered waves of public outrage and national studies which have confirmed widespread problems with these types of units (A Life Like No Other, 2007; National Study, 2009; Learning disability services inspection programme, 2012). An annual ‘Census’ set up in the wake of the Winterbourne View scandal found that 3,250 adults with learning disabilities remain in these units; over half have experienced self-harm, an accident, physical assault, hands-on restraint or seclusion during the three months preceding the Census. Last week, the Minister for Social Care Norman Lamb described a scheme set up in the wake of Winterbourne View to move people out of these hospitals as an ‘abject failure’ (HSJ, 2014). Connor’s preventable death brought home that these studies and reports are not just about statistics, they are about real lives ensnared in systems which deny people opportunities to flourish and leave them vulnerable to abuse, prolonged unnecessary detention and even death. As successive policy initiatives to address these issues have failed, it is clear that in some ways the problems have a very complex etiology – from a lack of resources and appropriate provision of support in the community, through to the failure of legal and regulatory frameworks which are intended to protect human rights. One study even suggests that the structure of our financial systems may favour models of care based on detention and ‘warehousing’ over support for independent living in a person’s own home and community, even though the cost of these units can be eye-wateringly high (NDTI, 2011). Yet in another sense, Connor’s death reveals that the roots of the issues can be remarkably simple, even if they are not easy to change. They are about recognizing – in law, policy and in everyday life – that people with learning disabilities have lives of equal value to others, that their aspirations, relationships, talents and individuality should be valued and supported on an equal basis with others. This is why Article 8 of the United Nations Convention on the Rights of Persons with Disabilities emphasizes the importance of raising awareness of the rights and dignity of people with disabilities and combating stereotypes. 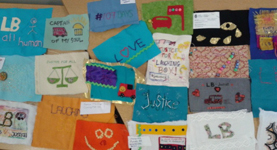 Activities like quilting may seem far removed from the law, but by creating a space to talk about Connor’s life – as well as his death – we hope to promote awareness of the capabilities of men and women with learning disabilities, and reflect on how we can contribute towards change in our work and everyday lives.